One of the foods most steeped in homemade-nostalgia for me is apple crisp. It is best enjoyed warm, and best composed of tart apples, not overcome by brown sugar sweetness, and still fresh enough to taste of fall. In my house we always made a little too much, which was just enough for breakfast the next morning. The former was eaten with ice cream, the latter with plain yogurt. Breakfast crisp, though a treat, still qualified as a “health food” (a loosely defined blanket term) because it was primarily composed of fruit, dairy (the butter), and a granola-like topping. So sometimes, at 7 in the morning when the dining hall looks especially dreary and there is a dearth of gooey apple desserts, I just want apple crisp for breakfast. Or sometimes at 7 in the evening I know the only thing I want for dinner is dessert. Apples are grown in all 50 states! With so many food services sourcing their ingredients locally, you can be sure seasonal apples will be on hand in the fall. To maximize on all the wonderful ways to work apples into your diet, here is a dining hall adaptation of a typically homemade comfort food. Although in the morning it may inspire consternation in the close-minded, come evening it breeds jealousy and/or admiration. It is round-the-clock delicious. Sarah Trautman is a Carleton College Junior who, while spending the fall term in NYC, discovered the best, most generously-portioned $2 falafel imaginable with the widest range of free extras, and has had a hard time eating anywhere else since. The granola I used was sweet and included walnuts, but add brown sugar and nuts as available if your granola is inadequate. Don’t be afraid of the cream cheese! It adds a delicious sweetness (think cheesecake) to the taste, just be sure to mix well. If you are feeling extravagant, add ice cream or yogurt as suited to the time of day (or not). Peel and core the apple, which is not too difficult with a butter knife. Slice thinly (less than 1/8 inch will cook quickly) into a small bowl. Add the cream cheese or butter, raisins, and cinnamon to the bowl. Mix thoroughly, being sure to break up the chunks of butter or cream cheese. Now is the time to add any inspired ingredient tidbits, like salad bar nuts, sandwich bar cheddar cheese, or coffee bar spices. Sprinkle 1 tablespoon water over the mixture, taking care to moisten a large area. This will expedite cooking time. 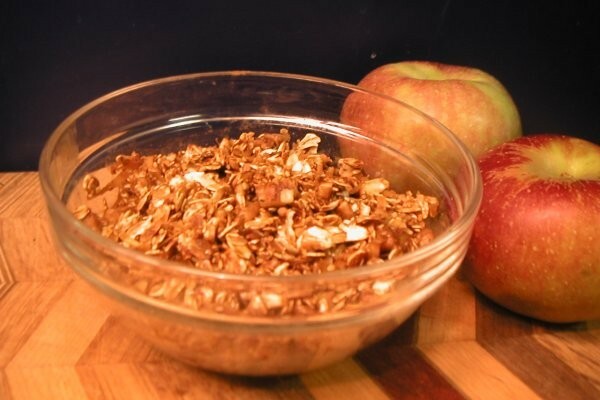 Cover the top of the bowl evenly with granola. Microwave for 1.5 minutes at normal setting, remove the hot bowl carefully, and check the softness of the apples. If your slices were thicker or your crisp was dry-ish, you may have to microwave the dish for another minute. Enjoy with plain yogurt or ice cream, if desired. I know my school is probably one of the only ones that doesn’t have a microwave in the dining hall… but would it be possible to include some dining hall DIY’s that don’t involve microwaves? You always find a way to mention yogurt, at least tangentially, don’t you? Sounds great though. Keep it up English major. Hey Monique–That’s too bad!! We’ll definitely talk about some that don’t involve a microwave. What school do you go to? i’m not afraid of the cream cheese. it excites me! i know i always enjoy a cheap falafel after a long run with a glass of mango juice. Wow that was good! It’s literally all I ate for dinner cause it was so good. I made 3 bowls! Definitely good after a long run. This really does sound like a good breakfast treat.